Place crackers, parsley, cheese, thyme, garlic, salt & pepper in a food processor. Process until smooth. Pour cracker mixture into a shallow dish. Place eggs in another shallow dish. Dip each tilapia fillet into egg mixture then cracker mixture; coating thoroughly. Heat oil in a large skillet and cook fillets about 3 minutes each side. 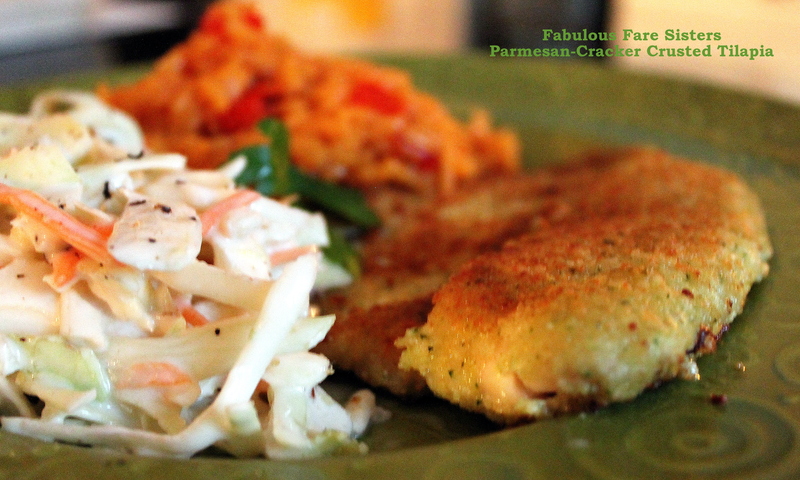 Serve with Heidi’s Coleslaw and enjoy a simply delicious meal! Love this recipe Linda! I am making it soon. Nice recipe. I would sub out another fish as I dislike tilapia. N.
This looks great Linda. That coleslaw from Heidi is creamy, perfect with the meal. Happy new week.